I've made home fries so many times that turning it into a recipe never occurred to me. Until someone asked. Here's what I've learned over the years: If you are cooking (boiling or baking) potatoes, always make extra for home fries. Potatoes love to be fried in duck fat, but vegetable oil is good enough. Don't add the onion too early, otherwise it will burn before the potatoes become sufficiently crisp. If you add lots of black pepper, you may get a bigger serving. 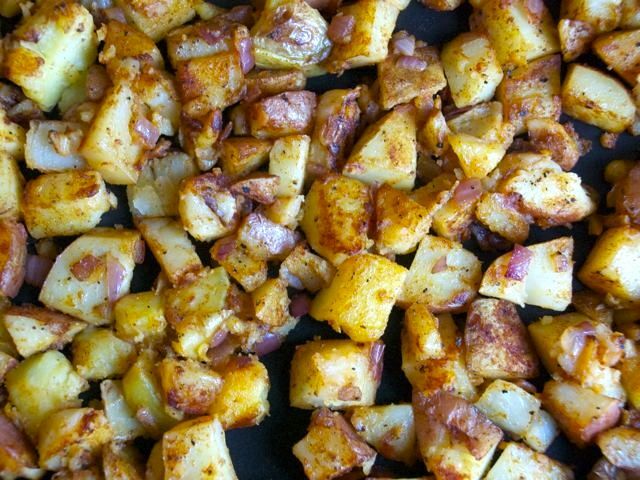 And, finally, leftover home fries taste delicious tucked into an omelet or breakfast burrito. Over medium heat in your pan of choice (well-seasoned cast-iron skillet, nonstick skillet, or griddle), warm the oil. Once it's hot, add the cubed potatoes and cook for about 10 minutes, stirring only if the potatoes are sticking. Add onion and spices; stir well to distribute. Continue to cook, flipping as infrequently as possible, until both sides are crisp; this may take another 10 minutes. Season to taste with salt and pepper, and serve.